(Guitar Method). The Hal Leonard Guitar Method is designed for anyone just learning to play acoustic or electric guitar. 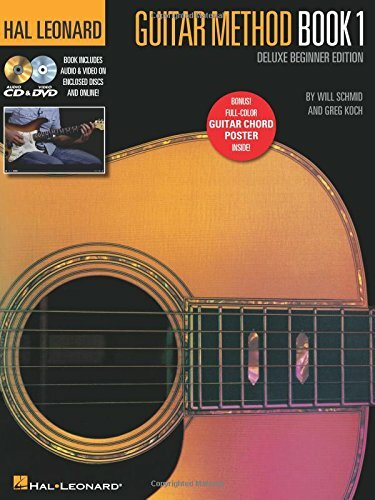 It is based on years of teaching guitar students of all ages, and it also reflects some of the best guitar teaching ideas from around the world. This deluxe beginner edition for Book 1 includes the book, online access to 48 audio tracks and 85 minutes of video lessons, plus an enclosed CD with audio tracks and a DVD with video lessons to go along with every lesson in the book. Bonus also includes a full-color guitar chord poster!